Suzuki Swift vs Baleno – Maruti is the largest car manufacturer in India , due to its wide service network and value for money Pricing . Maruti Suzuki Swift is the most selling car in India because it offers great value for money Pricing , Performance , Mileage and almost everything a hatchback should offer . Swift was first launched in 2005 in Indian Market and It shook the entire market . Now Maruti Suzuki has finally Launched the 3rd Gen or Third Generation Maruti Suzuki Swift in the Indian Market . Now Coming to the Baleno. Maruti Suzuki Launched Baleno in 2016 and sells it through Premium Dealership called Nexa . Just After its launch Baleno creates Buzz in the Market and it becomes one of the Most Selling Cars in India right Now with waiting Period of almost 4 months. The Reason Behind Baleno’s Success is its Space , Performance , Mileage , Design and NEXA Premium Service . Baleno was made to compete with Hyundai Elite i20 as Elite i20 was the First Premium Hatchback of India which passes the Compact Sedan segment as well. Both the Cars Maruti Suzuki Swift and Nexa Baleno comes with ABS , EBD and Dual Airbags as Standard But Swift offers Brake Assist as Well whereas Baleno doesnot offer Brake Assist. As 2 Airbags ,ABS and EBD are present in Both the cars so safety wise both the Cars are same. There is not such a big difference in safety of both the Cars . 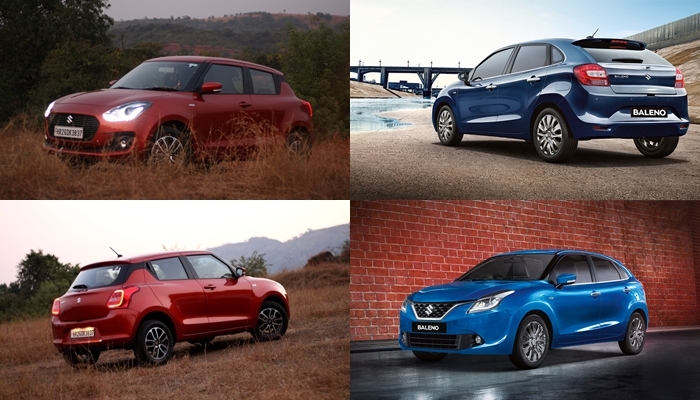 If Safety is your Priority then you can choose any cars among Swift and Baleno . Both the cars comes with same Petrol and Diesel Engines , Petrol variant of both the cars comes with 1.2 Litre 1197cc VVT Petrol Engine whereas Diesel Variant comes with 1.3 Litre 1248cc DDis Diesel Engine . Petrol variant of the Swift Produces 82 bhp Power @ 600 RPM and 113 Nm Torque @ 4200 RPM whereas Baleno Petrol Engine Produces 83 bhp @ 6000 RPM and 115 Nm Torque @ 4000 RPM . Diesel Variant of Both the Cars Produces 74bhp Power @4000rpm and 190 Nm Torque @ 2000 RPM on Paper. Well in Real Testing Conditions we found that Power and acceleration of both the cars are same but Baleno is just little behind in terms of Performance , But both the car performs well . Mileage Plays an important role in this Segment especially for Maruti’s cars . Well Maruti Suzuki Claims Mileage of 22 kmpl for New Swift 2018 Petrol variant and 28.4 kmpl for the diesel variant of the Car. Whereas Company Claims 21.4 kmpl for Petrol Variant of Baleno and 27.3 kmpl for the Diesel Variant . Well in Real testing condition we found that Both the cars delivers the identical Mileage figures , there is hardly 1-1.5 Kmpl difference between both the cars as Swift is lighter than the Baleno. Suzuki Swift vs Baleno : The New Gen Swift 2018 is sold by Maruti Network whereas Baleno is sold through the Nexa Dealership which is more premium than the Maruti Suzuki Dealership. Now Comparing the Nexa with Maruti Suzuki Dealership , we found that Nexa offers much more premiuim after sales and service. As Nexa is Maruti’s Premium Dealership Network such that Nexa Cars are given more priority than the Regular Maruti Suzuki Cars. As Service Point of View BALENO is better than Swift. Maruti Suzuki Swift 2018 vs Baleno : Both the Cars comes with Great Specifications and Features and almost all the specifications and features are same. Both Swift and Baleno comes with Android Auto and Apple Car Play supported Infotainment system , LED Drls Projector Headlamps etc . The feature which is missing in Swift is Steering Telescopic adjustment . As swift comes with only Titl Steering Adjustment whereas Baleno comes with Both Tilt and Telescopic or Reach Adjustment as well. Also From the Delta Variant of the Car Auto Climate control is offered in Baleno whereas Auto Climate control is Available from Z variants of Swift. Specifications and Features wise Baleno wins the Battle. As in Base Variants Baleno offers more features like electrically adjustable ORVM etc. Maruti Suzuki Swift vs Baleno : Coming to the Conclusion , As both the cars are from same manufacturer almost similar to each other , Both are Great Cars and offers Great Value for Money . You can go and buy any of these two Cars and you will not regret . However we feel that Buying Baleno makes much more sense as it is sold by Maruti Premium Dealership Network , offers much Better Space and Features which makes it much better buy. Baleno also comes with RS Variant which offers great Driving Exerience whereas Swift doesnot get any RS Variant as f Now. Also the Automatic Variant of Baleno is based on Higher Technology than of Swift as Baleno gets CVT Transmission whereas Swift gets AGS which is not that great when compared to CVT. Suzuki Swift vs Baleno .